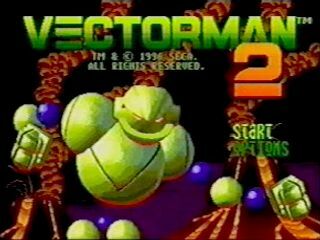 Released in November 1996, Vectorman 2 follows shortly after the first game. Instead of fighting Warhead and his minions, Vectorman fights the Black Widow Queen and her mutant insect minions. Gameplay is similar to the first game, except Vectorman has some new weapons and forms such as a pulse beam, a rhino form, and a fire ant form. Best Single-segment, Cool Difficulty Time: 0:14:03 by Mike 'mike89' McKenzie on 2010-04-18. Best Single-segment, Cool Difficulty Time: 0:10:52 by Ryan 'TheWinslinator' Winslow on 2016-06-01. SDA note: this run was later retimed in RTA with the new time being 14:03. Nate - the tech guru, what would the rest of us do without him? In one of those random events that could only happen to a speedrunner, I spent four months (on and off, admittedly) working on a speedrun of Vectorman before I got one I was satisfied with. The sequel, with the same mechanics and at times more annoying level design... took two days, and probably three hours' total recording. Much like with the first game, I just looked over the speedrun again and saw a bunch of improvements, mostly involving riskier strategies, and probably foresaw 30-40 seconds improvement. The end result (2:11 improvement) once again came as a surprise to me, but doubly so that it only took a couple of days for it to eventuate! Could've saved a couple of seconds here... Those two turtles have a pretty small window of opportunity to jump over them while they're facing the wrong way. The funny thing is that in practice for the marathon I found the first one much harder to jump over, but in all my attempts for this run I probably hit the first jump 90% of the time, but the second was no better than a 50/50 shot. He played nice and turned around pretty quickly though, if he had gone on further down the tunnel I would have had to restart. 51 is the worst I was going to accept, because that's what I got in my old run. Two seconds lost. The nice thing about this level is that not only is there a really fast route through it, but that route happens to go past one of the extra life pieces. It does mean forfeiting the second one, but that's the whole point of doing the run again, redoing it with much riskier strategies! Pretty easy boss, but it can be really nasty with the shots it fires in that they're very difficult to lead, especially if you're in close range (which you should be pretty much all the time). The second hit was kinda BS, but whatever. Three health is enough to survive the next level... just. Changed this strat up significantly. I now take two intentional hits, but it may or may not be faster to do it with three: you'll see at 5:52 I take out the enemy in the tunnel. The alternate route would be to go straight through there and take a third hit on the lava, which would result in you being knocked backwards and losing momentum as well. Instead I go over the top and land on the platform in the lava with my double jump (this will always happen, by the way, because those platforms don't start moving until you go past a certain x coordinate). In this case, which one is faster is irrelevant, though, because I only had 3 health to play with. Incidentally, it is possible to avoid damage by jumping on the exact frame that you land on the lava, but even if I mashed at 10 hits per second (which would be approaching my best) my chances are no better than 20%. I tried and failed both times, but you don't exactly expect that to come off, it's just a nice bonus. Really clean run here. Of course, I didn't pick up the extra life piece, and the next one is in level 13... so I have to be very clean for the next few minutes. I also have to get a bit of luck with health drops, I need to get to 3 health by level 13 because I need to take two intentional hits prior to getting the extra life piece. When I did the previous run, I knew that shooting it would make it turn around, I just wasn't good enough at that point to get any benefit out of it. In this run the boss never drops back into the lava. Very good fight, no complaints whatsoever. By the way, the shots whilst in the air appear to accomplish nothing, but they are very deliberate: jumping slows you down significantly, but every shot restores you to... not top speed, but a greater speed nonetheless. Failed to do the shooting after dropping off the first ledge which probably cost me 23, but oh well. What is of much greater concern is that I still have no life drops - there's no enemies in stage 11 and only three in 12. I'm basically preparing to restart at this point. Just going through the motions here, this is the simplest level in the game. What happens here is that one of those... enemies with large mouths... attacks you from the right hand side. Normally I'd drop off to the right, but this time I just dropped down the middle to give myself a bit more time to get the shots in... and he didn't appear. So I moved right, and there he was, and two shots killed him! He must have been just off screen and the shots still counted! But it gets better... Life drop! Now I can take my intentional hit on the second one and be on my merry way. Amazingly, I only lost about half a second to my usual time here. I normally hit high 21s, this was a low 22. At 9:37, ducking while shooting keeps the rhino stuck in place. For some reason if you get up and shoot he starts being able to charge at you. Really the one thing that makes or breaks this level though is the last charge at the end. I managed to just get my charge off before the second rhino got in the way and ended with my best time here. Now it's time for the big time savers. Since jump-boosting is so much better damage-wise than just shooting, I wonder why I didn't do it in the previous run? I was probably too concerned about damage, and I will say that full health out of Cave Fear certainly made this level a lot easier. I've gotten as low as 13, but I'm not going to complain with what I got. I missed the jump to the end of the level. Twice. Screw this game. Was a little bit unlucky with the ascent, but very lucky to clear the boss in two passes. I thought I was no chance after missing the last hit on the first pass (the boss's shots were positioned very evilly, if that's even a word). This is the one level I'm not really happy with, which might seem an odd thing to say in a level with a 22 second improvement. Most of that, however, comes from a very sweet shortcut at the end. Next, a very tight jump to the first checkpoint. My cue here is the bug that appears on your left: as soon as it hits the top of the screen then you can boost and get through. 9:34 is the real reason I'm not happy with this level. When the second block from the bottom residually destroyed the third, I deviated from the plan and went to take the top one out instead of the bottom one. For reasons unknown to me, if you stand right next to a block and shoot it, apparently the shot goes right through (specifically, it starts from the other side of the block). I also took a hit, compounding matters, as I now had one health, and I didn't trust myself to get through 19 on one health. I therefore activated my contingency plan: taking the route from the old speedrun and picking up the extra health piece on the way. My intended route more closely mirrors the TAS: at 9:23 I would go right, and send the tornado up through a small hole in the ceiling. The problem is that you have to mash C really fast to get up that high, and you only get two shots at it before your tornado runs out (there's another tornado nearby but by that stage you've lost a lot of time). It's probably about five seconds quicker if you hit the tornado jump first go, since you can practically be at the next wall of bricks when the tornado runs out. Now for the fun part. Instead of going down into one of the gaps and climbing all the way back up, I'm going to go straight across the top. A couple of things make this tricky, but the most obvious one is the fact that the blocks can destroy each other, so you need to be sure that the block you're using for the jump isn't about to be destroyed before you use it. For the second jump, to be assured of getting across you need to start your jump from at least three blocks high. For the third, you have to stand on the brick two below the one at the top: any higher and you hit the ceiling, any lower and you aren't guaranteed to make the distance. You can make it from three below, but it requires a bit of luck with the random wind gusts. In order to get that high in the first place, though, you need to make a gap of three blocks in the wall so that you can jump out and reach the height you're after. So there's a bit of setup involved, but it still saves 20+ seconds over going into the pit. And then right at the end I deviated from the plan AGAIN and the same thing happened. The fact that I didn't learn from the first time is what really disappoints me. This has to be my favourite part of mmbossman's TAS. Apparently all that you have to do to make those stupid bugs go away is face left! Then they never spawn! How ridiculous, and yet how simple. I took a lot more damage than I should have in this level, but I did have a lot of damage to take, after all. Being on as low health as I was probably cost me a second pre-extra life piece, but after that it was never a question of if, but how quickly. There's no way I can lose the run from here. Of course, that's what I said last time, and look what happened there! This time I got it clean, no worries. I also had test runs as low as 46 using this strategy on the first phase too, but I immediately launched into the jump-boost one and decided (especially after 18) that sticking with the plan was the best way to go. Still improvement to be had, of course. My best in level 18 is 1:01, that could be achieved just with better luck (and not losing so much life earlier). A couple of seconds in 2, a couple in 16, one each in 8, 10 and 13, as well as going for a riskier final boss, could see about fifteen seconds' improvement.